Evaluation of the efficacy of SESHA SKIN THERAPY A.C.E. Cream with PET™ delivery system. Changes in the skin’s epidermal density, thickness, color and wrinkles depth were monitored using ballistometry, ultrasound B-mode scans, photographs, clinical assessments, silastic castings, and skin sample biopsies. Double-blind, 180-day skin test on 15 subjects 50 years and older. Histological examinations of skin biopsies taken on days 1, 60, 120, and 180 clearly showed that the epidermis becomes thicker with the use of A.C.E. Cream. 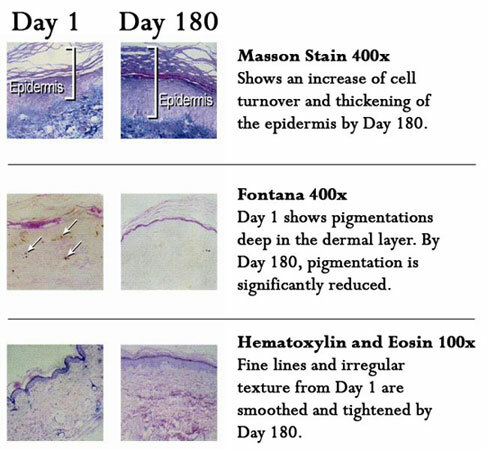 Epidermal thickness (Masson Stain Slides) increased by 19% or greater over the course of the study with some subject samples showing a 50% increase in epidermal thickness. The stratum corneum (Masson Stain Slides) also shows increased signs of a basket weave pattern that is typical in younger skin. Most subjects also showed a histological increase cellular growth of the dermis. This finding is consistent with the restructuring process of the dermis. Ultrasound evaluation of A.C.E treated skin also showed a gradual increase in skin thickness and density for up to three or four months before reaching a steady state. This further supports the proposed proliferation of the epidermis followed by dermal restructuring effect caused by repeated application of A.C.E. Cream. Study conducted by Peter T. Pugliese, M.D.